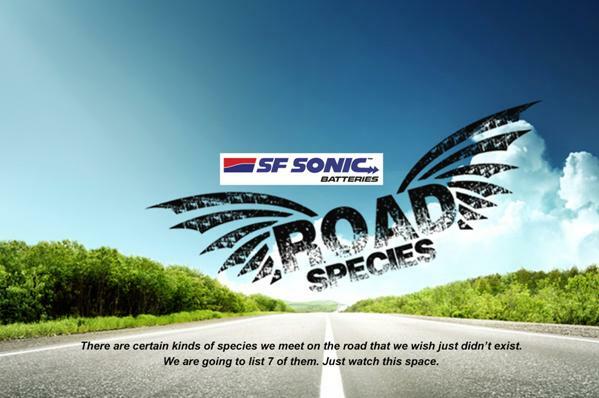 Sf sonic car batteries, one of the leading battery brands in the market. Brings you the #SFsonicroadspecies series. This article gives an interesting twist to everyday characters we meet on the road. There’s something about the road that brings our animal instinct out. A sense of freedom? Power? Speed? Or just the thrill of controlling a moving machine? Whatever it is there are certain kinds of species we meet on the road, more often than we would care to. Here are the seven we wish evolution would do something about. Perhaps this species has not yet evolved enough to realize that the horn is not an accelerator. That the constant phranp-phranp-phranp-phranp is not going to move the traffic in front any faster. We need to find a way to tie this species’ hands before we go deaf. Also know as the ‘Just-can’t-wait-asaurus’. Impatience flows in their veins instead of blood. Looking for the slightest opening between cars, you can see them jump lanes, cut cars off and treat four lane highways like a single lane at Daytona. Somebody should be telling them that finally all life meets at the red signal, what’s the hurry pal. Pedestrians and drivers at crossroads beware. This species believes that the road was made for them and was created for one purpose only. To press the accelerator hard and feel the speedometer go as far to the right as it can. Seen everyday, till of course, they get on to the wrong side of fate. Hospitals have a detailed record of this species – name, address and bones broken. This species could still be forgiven if they had better taste in music. Unfortunately their full volume mega-boost music systems only dish up bass, bass and more bass that sound more like an approaching horde of elephants than rhythm. If our eardrums had a vote this species would be out for extinction. This whole herd believes that the road is the perfect place to slow down and enjoy life. Except they forget they are on a 80 road when they do 40. Oblivious to the glares of the cars that pass by, deaf to the pleas of horns and dippers behind them, they continue their slow drive down to driver notoriety. A fast solution is very much called for here. How close can I get without touching you seems to be a game for the Tailgators. Screaming down on top gear you can see them zoom in on your rear view mirror, all this time wondering whether they are going to crash into your bumper. The game is simple. They are on your tail till you move out of their way. An Aston Martin with rear machine guns from a James Bond film would be the perfect antidote for these animals. Night time has never been a good time out there in the tar jungle. Especially when the Fullheadlightonodons are out for their nocturnal trips, the headlights and in many cases their fog lamps turned to full. You get in the way and you feel like a deer caught in the crosshairs of a camera flash of a National Geographic photographer in the forest. Red spots and temporary unsighting of the road ahead are just the symptoms that tell you one of this species just crossed your path.